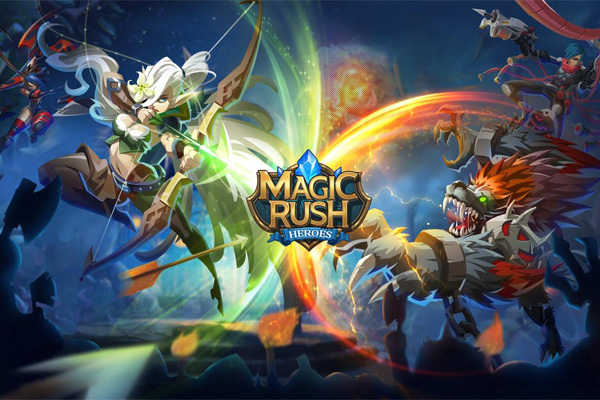 Magic Rush: Heroes is a world-first revolutionary combination of skill-aiming controls, a thrilling, real-time PvP Ladder Tourney mode, exciting multiplayer World Map battles, simple yet addicting Tower Defense, and more! Experience the fun of multiple different genres all wrapped up in one extraordinary game. An unforgettable journey that you won’t regret! During the Google Play Year End Deals period, Magic Rush is releasing a special 80% off discount pack. Don't miss out on the best deal of the year! Manually choose targets or directions when casting skills. You call the shots! Stun, silence, knock airborne, and heal using precise controls, and even interrupt the enemy’s skills. Master this blend of strategy and tactics, and victory is truly in your hands! Diverse hero occupation types, dozens of heroes, and hundreds of distinctive skills. Try out different combinations of heroes and take the opposition by storm. Equipment enhancing, rune inlaying, and every kind of weapon has its own upgrade path and unique abilities to unlock. It is the ultimate Equipment System. A global, cross-server PvP Arena with a turn-based ban/pick phase to level the playing field. Strategically ban your opponent’s heroes depending on your own battle plan. Win awesome rewards every season! Build your city, upgrade tech, and then dispatch your armies to plunder resources from your enemies. Create alliances with millions of players from around the world to survive and thrive in this war-torn landscape. Conquer your enemies and become the dominant alliance! An all-new “Hero Tower Defense” concept cleverly combines the heroes of the game with dozens of exquisitely designed Tower Defense stages, one-of-a-kind map creations, and exciting battles. A fun experience that you won’t want to put down! Hard-working developers are constantly updating and improving the gaming experience with new gameplay, new heroes, in-game events, and more. Weekly updates based on your feedback and suggestions! Magic Rush: Heroes: install apk and play the game!